What happens when you have committed to remodeling your master bathroom and you discover the shower in your second (guest bathroom) is leaking and damaging the ceiling below? 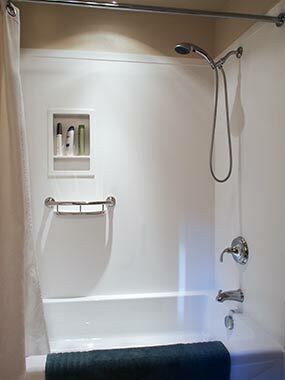 You ask your contractor to gut the bathroom tout suite and buy a gym membership so you have a place to shower. 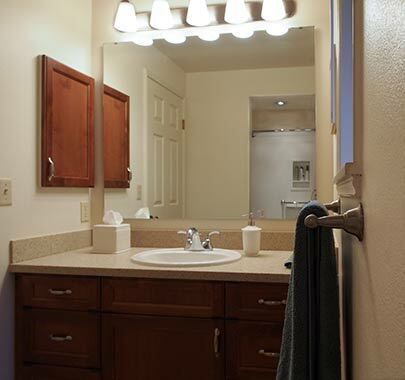 The objective of this project was to repair the leak and the damaged it caused, replace all the fixtures and finishes as quickly as possible to minimize bathing and grooming at the gym and then create an attractive and affordable, easy to use and maintain bathroom for guests and family. 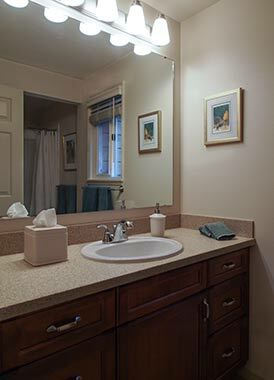 The solution was to use readily available materials such as a standard acrylic tub with solid surface shower surround with build in shampoo niche and grab bar, non-slip linoleum flooring and incorporating a vanity that maximized storage and counter space. "My sincere thanks to Molly, Clive and all the contractors for making a job I had dreaded into one I truly enjoyed. My new guest bathroom is wonderful. A job well done!" ~ Julie R.